India is popular for publishing Obituary ads on a regular basis. It is a country of different cultures, religion and diverse languages. People love to relive the memories related to their near and dear ones who they have lost through Newspaper obituary ads. A certain section of the Indian Population prefers to publish Obituary advertisements in English in popular English dailies. The content of the message needs to be expressive and unique along with being well-written. The grief and emotions due to the loss of the concerned person should be clearly expressed through words. There are quite few types of paid Newspaper obituary ads. But the two most commonly published ads are death notices and personal Obituary Messages. Death notices usually omit most biographical details and is more of a legal document or public notice. Personal obituary advertisements are generally composed and dedicated by family members or friends. They can include Death Anniversaries, Condolences, Funeral invitations, remembrances etc. Both these types of Obituary ads are published as either Classified Ad or a Display advertisement. The Times of India: Owned by the Times Group, The Times of India has a circulation of 31.40 lakhs daily. The Times of India is the most widely read English newspaper in India with a readership of 76.43 lakhs and has maintained its record for quite a few years now. It has editions circulated in major cities such as Delhi, Mumbai, Kolkata, Chennai, Hyderabad, Bangalore and more. Hence Times of India is a good choice for Death and Obituary related advertisements. The Telegraph: This is an English daily founded and published in Kolkata, West Bengal since 7 July 1982. It is published by the ABP Group and according to the Audit Bureau of Circulations, it has a circulation of 4.84 lakhs daily. The newspaper is the fourth most-widely read English newspaper in India (following Times of India, The Hindu and Hindustan Times) with a readership of 13 lakhs across the country. The New Indian Express: Owned by Express Publications (Madurai) Limited, based in Chennai, the New Indian Express has a net paid circulation of 4.35 lakh copies. Itis now published from 22 major cities of Orissa,Karnataka, Kerala and of course Tamil Nadu. The New Indian Express is published in a geographical area that covers approximately 24 % of the national population. At present, The New Indian Express is the only national daily which publishes news of far-flung Andaman and Nicobar Islands on an everyday basis which helps advertisers reach out to different corners of the country. The Hindu: The Hinduhas its largest base ofreaders in southern India where it is the most widely-read English newspaper, especially in Kerala and Tamil Nadu. It is owned by The Hindu Group, Kasturi and Sons ltd and headquartered in Chennai. It is the third most widely-read English newspaper in India and has a circulation of 14.6 lakh copies daily with a readership of 22 lakhs. Hindustan Times: Owned by HT Media Limited, Hindustan Times the second largestnewspaper in India, in terms of circulation and readership. Based on the survey by theAudit Bureau of Circulations, HT has a daily circulation of 14 lakhs. The Indian Readership Survey revealed that HT has approximately 37.67 lakh readers; making it the second most widely read English newspaper in India. It is popular in northern India and certain specific other parts, especially in the following cities- New Delhi, Mumbai, Kolkata, Patna, Ranchi, Bhopal, Lucknow and Chandigarh. Mostly North Indian’s prefer publishing Obituary and remembrance advertisements in Hindustan Times. Deccan Herald: Owned by the Printers Private Ltd, Deccan Herald has a circulation of 2.15 lakhs daily. According to the Indian Readership Survey 2013, it is among the top ten most widely read English language newspapers in India, with an average daily readership of 4.58 lakh. In order to make your Obituary Advertisement reach out to your target audience, you can choose from the above newspapers. You can make your selection based on your preferred location or simply choose the one that reaches out to maximum regions of the country at once. You can take the help of several online newspaper ad booking portals through which you can book your Newspaper Obituary ads in your preferred newspaper in just a few steps without the hassles of visiting a publication house or paying extra to an offline agent. 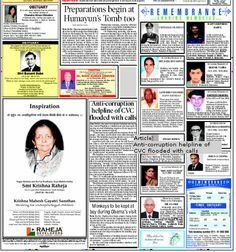 This entry was posted in Newspaper-Obituary and tagged newspaper-obituary-ads, obituary-ads-in-english-newspapers, the-hindu, times-of-india on September 4, 2014 by obituaryads.